Read this tutorial from 7Downloads to learn how to update SHAREit on your PC. This is a step-by-step SHAREit update guide which anyone can follow. Please read the article carefully to learn all the important things about SHAREit. SHAREit is a file transfer tool that was developed by Lenovo for Android phones. And then they added some support for other platforms such as iOS and Windows. Most of the people prefer SHAREit since it has the ability to send and receive data between different operating systems quickly and easily. There were days when you had to connect your smartphone to your PC using USB Cable to transfer files between your devices. Back then people used a pen drive to transfer files from one PC to another. But now, you can do it without any physical connection between the two devices. SHAREit uses TCP or Transmission Control Protocol to transfer your data. In simple terms, it means that the data to be sent is first broken down into small pieces called ‘packets.’ These data packets are then transmitted to the receiver, and when all of these packets have been successfully received, the receiving device combines them to make the original file once again. Some requirements which should be met before you install or update SHAREit on your PC are. 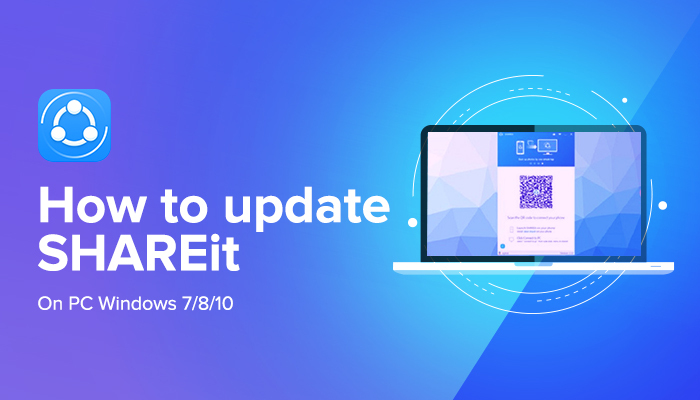 Since the developers of the SHAREit app constantly tries to introduce freshly brewed features in their app, it is very important to update your SHAREit version on your PC from time to time. If you do not update it for a long time, you might end-up facing compatibility or stability issues. Also, you won’t recognize the newly added features for SHAREit on your PC and thereby, not be able to use them. Hence, it is really important to keep your SHAREit version updated. So let’s understand the steps which on how to update SHAREit to the latest version. Step 1. Launch SHAREit to your Windows PC. you will find the version of your SHAREit on the upper left corner of the application. Step 2. On your browser, go to 7downloads official website and key in SHAREit to find the application. You can then make a comparison between SHAREit on your device and SHAREit on 7downloads website. Step 3. Once you made the comparison and found out that you are using an older version, click on the download button to get the latest version. Step 4. Once the file finishes downloading, go to Downloads folder on your computer. Search the file with the name SHAREit. Right-click the file and run to start the installation. Step 5. Follow the dialog boxes which pop up to finish installing the app. Once it finished installing, you can now use the latest version of SHAREit. Using the above method, you can learn how to update SHAREit on your own. Once you update SHAREit to its latest version, you can make use of the newly introduces features. If you encounter any difficulty in executing the steps mentioned above or if you have a better method, then please let us know in the comments section below. Some of the features of SHAREit which make a difference are the following. The interface of SHAREit is very simple. It is compatible with all devices running on different platforms. You can share a file or multiple files in a matter of seconds. You can share files with many people at the same time. Sharing files without internet connection is possible; allowing users to send or receive files like audio, video, and images and install applications without downloading them. Using SHAREit, you can send photos, music, videos, apps and other files with no size restrictions. You can also backup your data with a single click and never lose out on important files. The simplicity of SHAREit made a big impact on the users. It is widely known and used by many all over the world. However, if you do not update your SHAREit when there’s a new version available, you will not enjoy all of its functionalities. So, it’s better to check SHAREit from time to time and as much as possible.